WE HAVE A PASSION TO SERVE OUR CUSTOMERS BY GOING BEYOND JUST BANKING, IF YOU SHARE THE SAME PASSION, WE ARE LOOKING FOR YOU. Developing new corporate relationships while strengthening existing key revenue generating relationships. Evaluate and submission of quality credit appraisals and reviews. Improve the quality of the portfolio and work along with the business team to implement corporate banking strategies to achieve short and long term objectives. Manage a team of Relationship Managers and provide leadership to develop their relationship management skills and achieve their individual job targets and team objectives. Contribute to overall strategy formulation, conducting market and competitor analysis , trade flows and innovative deal structures. Keep abreast of current developments and market trends to better identify business opportunities and to grow the portfolio. 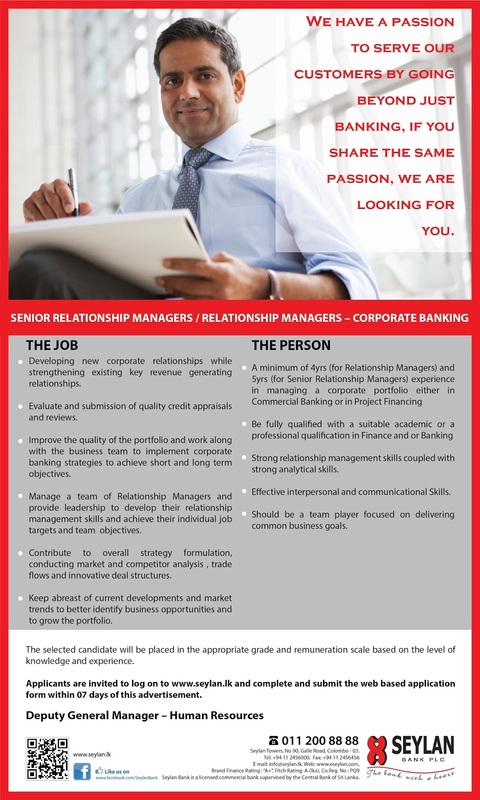 Strong relationship management skills coupled with strong analytical skills. Effective interpersonal and communicational Skills. Should be a team player focused on delivering common business goals. The selected candidate will be placed in the appropriate grade and remuneration scale based on the level of knowledge and experience. Applicants are invited to log on to www.seylan.lk and complete and submit the web based application form within 07 days of this advertisement. www.seylan.lk Seylan Towers, No 90, Galle Road, Colombo – 03.